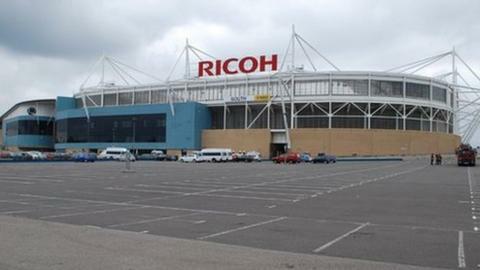 Coventry City have had their bank accounts frozen by Arena Coventry Ltd in a major escalation of the ongoing row with their Ricoh Arena landlords. ACL has issued the League One club with Third Party Debt Orders, in an attempt to collect the 11 months' rent arrears, now up to £1.3m, that they are owed. In an official statement, the ACL board say that they had no choice but to serve the orders on the club. But they also underline that it is not a winding-up order on the Sky Blues. Coventry have been at loggerheads with ACL since they stopped paying their £100,00 monthly rent last April, claiming that it is too high, given the fact the club are only tenants and make no money from the sale of refreshments and on-site facilities at the ground. The club were initially given until Boxing Day to pay up, or face a winding-up petition, a deadline that was then extended until 2 January, since when the two parties have been in negotiations. But, following the breakdown of talks on Thursday, ACL went to a judge and Third Party Debt Orders were granted on the club's account, its card payment account, its Business Rates account with the City Council and Huddersfield Town Football Club's account. This prevents any money going out of the club and blocks any money due to come into the club from Huddersfield, who are reported to have agreed a compensation package for luring Sky Blues manager Mark Robins to the John Smith's Stadium. Robins, along with his number two Steve Taylor, was appointed as Huddersfield boss on Thursday. Lee Carsley is in temporary charge of the Sky Blues, who face a trip to Bury on Saturday and the second leg of their Johnstone's Paint Northern Area final at Crewe on Wednesday.